Friday 28th September – Australian Market Wrap | Beeks Downunder-Because not all financial news is boring! ASX 200 cruises through 6200 up 26 to 6208 as banks run out of puff at close. High 6234 Low 6184. Big volume following ETO expiry. ASX 200 up 12pts for the week and the quarter. Yes really. Banking Royal Commission focusses on greed and regulator failure. Miners sidelined as banks rise initially. BHP looking good. AUD slips to 72.17c on USD strength. Yen hits a new low. Aussie Gold weaker at $1641. WGN +2.84% pilot training win. HLO -4.74% profit-taking after huge run. MQG -1.34% German woes weigh. CSR -2.33% US housing weighs. TBR +12.20% revised date for second dividend payment. NHC +3.95% positive coal price moves. Speculative stock of the day: Biotron (BIT) +115.79% after a significant immunological outcome in BIT222 HIV-1 Clinical trial. Phase two showing significant benefits. CIMIC (CIM) +0.80% CIMIC Group’s construction firm CPB Contractors as part of the Rail Infrastructure Alliance (RIA) has been awarded a $1 billion package of works by the Victorian Government in support of the $11 billion Metro Tunnel Project. Westpac (WBC) +1.16% Announced it will cease to own Ascalon Capital Managers following a deal with Generation Development Group Limited (GDG) under which GDG will invest in Ascalon and become its ultimate owner. Residential mortgage lending has risen in August while household debt has risen to 190.5% of household income, up from the last measured ratio of 189.6%, according to the latest data from the Reserve Bank and Australian Prudential Regulation Authority. Loans to owner-occupiers rose 0.48% to $1.09tn and lending to investors was up a slight 0.03% to $557.6bn. 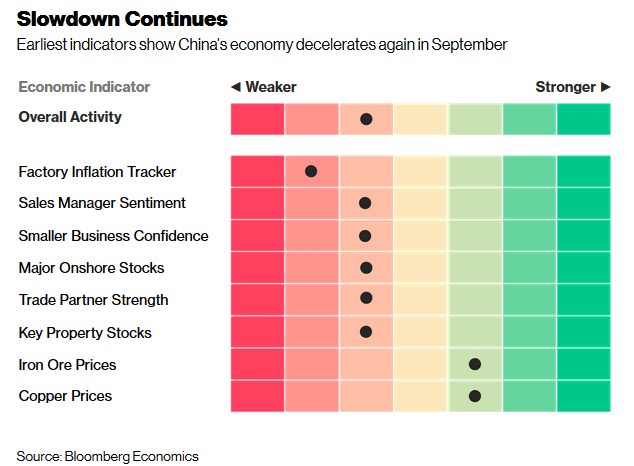 Leading indicators for China’s economy show growth continued slowing in September amid the escalating trade war with the U.S.
An index developed by London-based research firm World Economics, based on a survey of sales managers in China, tumbled this month to its lowest level in two years. Hong Kong house prices declined for the first time in 29 months in August. Industrial production in Japan grew at a slower pace than forecast in August while retail sales posted the fastest rise in eight months. Elon Musk accused of fraud by SEC. May face ban from board of Tesla. British consumer confidence dipped lower in September amid uncertainty around Brexit.Boris Johnson unveils his ‘cunning plan’ for Brexit today in the media. A little late perhaps. Should have had a plan going into the referendum. Global M&A activity hits a record. US3.3 trillion of deals in 2018. The US is working to stop Chinese telecoms giant Huawei from building a major internet infrastructure project in Papua New Guinea. The WTO has downgraded global growth on the back of the trade wa bu 0.5% to 3.9% and 3.7% next year. Postman Pat creator has died. Wherever you are may your team win this weekend. Clocks go back next weekend. NSW public holiday Monday.